Every year, the Organisation for Economic Co-operation and Development (OECD) produces a massive report that rolls up a considerable range of education data and trends. The latest installment in this series, Education at a Glance 2017, was released last week and it describes a rapidly expanding tertiary population worldwide, along with continuing growth in education spending throughout the OECD area. Across OECD states, the percentage of 25-to-34-year-olds with a tertiary qualification has increased considerably over the past decade, from 26% in the year 2000 to 43% in 2016. And those students, the OECD conclusively finds, are more likely to be employed and with much better earning prospects (56% better, on average) when compared to peers without a tertiary education. On the international front, Education at a Glance 2017 highlights the dramatic growth in global student mobility, particularly during the 20 years from 1990 to 2010. 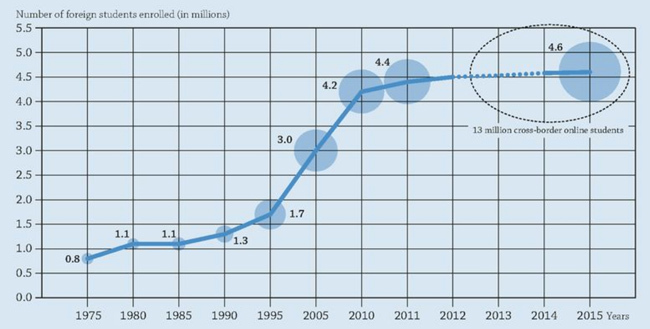 As the following chart illustrates, the total number of tertiary students enrolled outside of their home countries had hovered around one million from the mid-1970s until the late-1980s. The number of higher education students abroad began to climb rapidly at that point, and is estimated at nearly five million today. The OECD has elsewhere projected that the total number of internationally mobile students will reach eight million by 2025. But Education at a Glance 2017 puts that forecasts in an interesting light with an examination of the some of the factors that are acting on broad patterns of mobility in the world today. These are especially meaningful when we consider the latter years in the chart below, where growth in outbound mobility has begun to flatten out noticeably from about 2010 on. Immigration policy in major host countries, particularly with respect to any restrictions on student mobility as well as work opportunities during and after study. Macro economic trends, and especially those that bear on exchange rates between the currencies of major sending and destination countries. Tuition policy for foreign students, which, as the report points out, currently varies considerably with the OECD with some study destinations charging significant differentials for visiting students. Language of instruction: English remains the lingua franca of an increasingly globalised world, and major English-speaking destinations, including the US, the UK, Australia, and Canada, host a majority of mobile students. However, there are two forces acting on this historical market dominance. First, the rapid expansion of English-taught degree programmes at both the undergraduate and post-graduate levels, and especially in Europe. Second, the emergence of major regional study destinations whose native languages also figure prominently in the global economy, including Germany, Russia, and China. This entry was posted in Africa, Asia, Australia/Oceania, Europe, Higher Education, Middle East, Most Popular, North America, Regions, Research, South & Central America and tagged student recruitment, higher education statistics, colleges with international students, student mobility, OECD.